Wes Craven is know primarily for 2 movies, 3 if your a big horror fan. Those films are Nightmare on Elm Street, Scream, and Last House on the Left. All fantastic films in there own right. 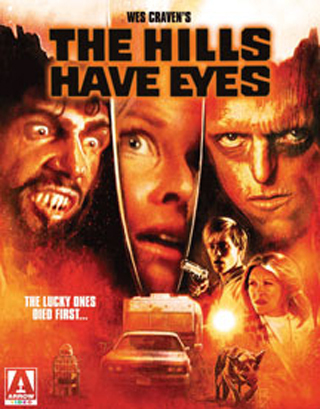 However back in 1977 Craven made The Hills Have Eyes. A fantastic film, that not only spawned a sequel, that Craven later disowned but a remake in 2005 as well. Over the years the film has continued to build a huge cult following and now, finally the fine folks over at Arrow are releasing this in a new collectors edition it so well deserves. Hills Have Eyes is the story of The Carter family. There on there way to California but decide to make a stop on the way to some old silver min out in the middle of the desert. There accompanied on this trip by there daughters husband as well as there dogs. They stop for gas at an old gas station and are warned by the owner not to go out in the desert as the military uses it for weapon testing, and the silver mines have been empty for years. They pay no mind and head out only to have there camper crash in the middle of nowhere where they soon become the prey of an inbred family of cannibals lead by Papa Jupiter. The "Family" slaughter several of the Carters, murders there dogs and even steals their newborn baby. In fact the scene in which Papa Jupiter's family attack the camper to steal the baby was ranked number 41 on Bravos 100 Scariest Movie Moments. Now that's a loaded Disc. The film alone is enough to buy as the video transfer is beyond gorgeous. Its one of the nicest transfers to date. The special features only add to this package. And if for some reason you need another reason to pick this up Roger Ebert gave the film a thumbs down and called it "Decadent" and it is, but in a good way. Beautiful transfer, loaded extras, and a fantastic film that still stand the test of time. I just got done watching it and I must say it holds up perfectly. I recommend any fan of the film or horror fan in general picks this up.